Sorry means feeling regret, feeling disappointed with something you have done that hurt another person. However, nowadays we say sorry so frequently that it doesn’t even evoke the feeling of regret anymore. It has become more like a formality than an actually heartfelt apology. More often than not, unknowingly, we just utter the word sorry without truly meaning it and without really considering whether our ‘sorry’ has actually made the other person feel better or not, which is the whole purpose of an apology. Whenever we are at fault, we just say ‘I’m sorry’ thinking that the two words will suffice for the mistakes we have done. Don’t treat sorry as just another word. Make the sorry meaningful. Actually, you don’t even need to use the word ‘sorry’ to apologize. You can simply do it by actively making efforts to amend your mistakes and consoling the person you have hurt or offended. 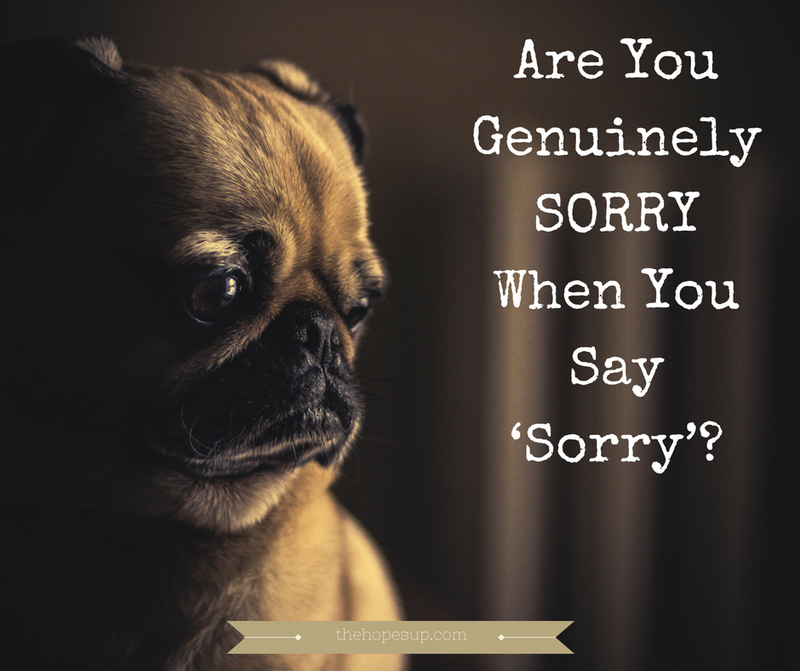 Your actions will have more impact in displaying your apology than a few hoary words. For a genuine apology, you need to understand how your behavior and actions affect the other person. If it is affecting someone negatively, you need to make it right by apologizing sincerely and not by faking it. Acknowledge your mistake and make sure you don’t repeat the same mistake. Acknowledging your mistakes doesn't make you a lesser person, instead, it shows that you are aware of yourself, you understand yourself well and know where to make corrections. Clearly, state why you’re wrong and what you can do to make the situation better. Instead of a fake sorry, try to understand the emotions of the other person, and solve the problem at its roots. If you get to the root of your mistakes, you won’t have to mindlessly use sorry anymore. Reflect your apology from your actions. Don’t just stop at "I’m sorry", work on "how can I make things right?" Next time when you are at fault, instead of just spitting out the word sorry, first admit your mistakes properly. If you’re able to acknowledge your own mistakes, you’ll be able to make the other feel that you are sincerely sorry. Just a mere "I'm sorry" is not enough anymore, it needs to be coupled with adequate reason i.e., taking responsibility for your mistakes and promise i.e., you will not repeat the same mistake and try to make the necessary changes to not end up in the same situation again. Remember words don’t mean anything unless you believe in what you say. What are your thoughts on this topic? Share with me in the comments below.